The man who is leading the drive to improve the health of the people of Sunderland and South Tyneside has been honoured. Ken Bremner is Chief Executive Officer of City Hospitals Sunderland NHS Foundation Trust, and, uniquely, is also CEO of a second health trust, South Tyneside NHS Foundation Trust. 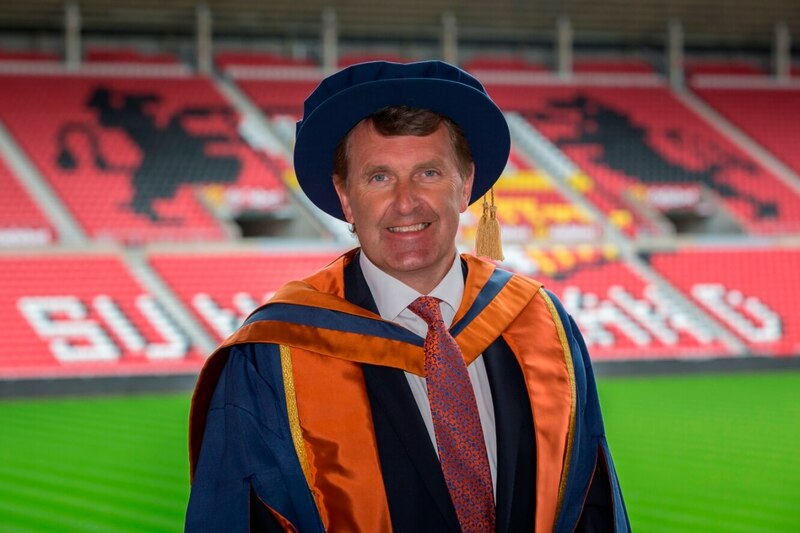 He received an Honorary Fellowship from the University of Sunderland today (Tuesday, July 11). Mr Bremner received his award in recognition of over 35 years of service to the NHS in the North East. He said: "I feel this award is really recognition of the work of the 8,500 members of staff who work so hard to provide the very best of hospital and community care for the people of Sunderland and South Tyneside. "I have seen many changes in the health service over the years, but what has remained constant are the many wonderful prospects there are for graduates. These are roles where a difference can be made both now and for future generations. "We need more people with both skills and education in a number of disciplines, and I am hopeful that by working with the University of Sunderland we can develop programmes and courses which will help us resolve some of those problems. With the development of the Sunderland School of Nursing we are optimistic that over the coming years nursing shortages will be eased by employing nurses who have enjoyed their time in the city and want to remain here. "By helping our students and graduates succeed we will also succeed." Ken Bremner became Chief Executive of City Hospital Sunderland in 2004, and in 2016 became CEO of South Tyneside. The Trusts jointly employ over 8,500 people, and have a combined turnover of £554 million. During his 35 years working for the NHS in the North East Mr Bremner has championed closer links with the University of Sunderland, collaborating with the University’s long-established work in pharmacy and pharmaceutical sciences. Mr Bremner was instrumental in the foundation of the University of Sunderland’s School of Nursing in 2016. He also has a community-wide role as chairman of the Sunderland Partnership, which works to foster improved opportunities for skills training, jobs, economic growth and culture. They are key supporters of Sunderland’s bid to become City of Culture 2021. £3.5 million is being invested in the University of Sunderland School of Nursing, which was launched in 2016 with its first degree, BSc Adult Nursing Practice. The new School of Nursing on City Campus, Chester Road, will include two mock wards, assessment suites, a mock Patient Transfer Suite and an industry-standard Positive Pressure Isolation Room.